At the end of the Injen PowerFlow Intake is the Injen High Flow Air Filter Element. It has been strategically positioned behind the front bumper and inner wheel well to acquire colder air while still being protected from the elements. The Injen air filter that can be cleaned and reused for as long as you own the vehicle. An air stabilizer and incorporated velocity stack smooth out airflow to help maximize power gains. 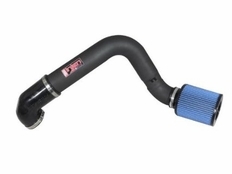 Comprehensive installation instructions including photos make installation of your new Injen Intake easy enough to do yourself with basic hand tools in under an hour. Everything you need to install this air intake is included. The part number for this item is PF5061BLK and it fits 2005-2014 Chrysler 300c Dodge Charger , Magnum, 2009-2013 Dodge Challenger 5.7 and 6.1 Hemi models.